During the organisation of your wedding, with the never ending list of things-to-do, one small detail seems to be overlooked… The wedding rings! They may be small in size, but their value is one of the most important aspects of the day, according to their symbolism and traditions. 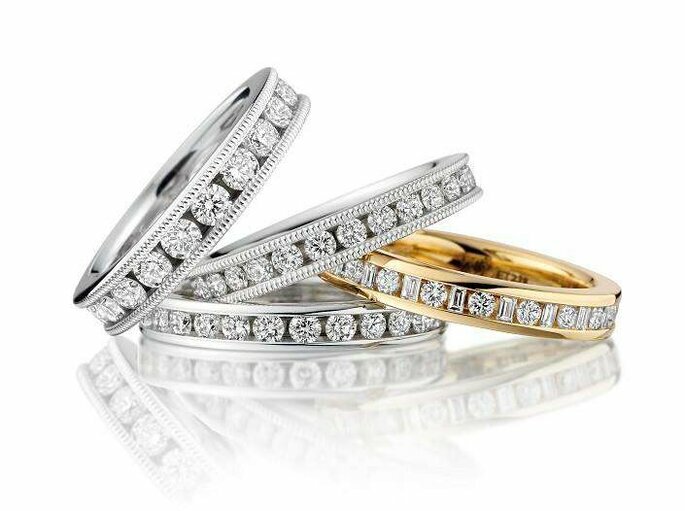 Follow these 5 steps for choosing the wedding rings of your dreams. The budget is always the starting point for wedding planning. This will be inextricably linked with your chosen material, which can increase or decrease the price. By including more valuable components, such as diamonds or gold, the budget will change. Also take into account the design of the ring, as there are different shapes, styles and finishes with different values. The most innovative jewellers with unique designs will be a lot more expensive, for example, but infinitely worth it. Your wedding ring will be a keepsake for a lifetime, so adjust your budget accordingly. 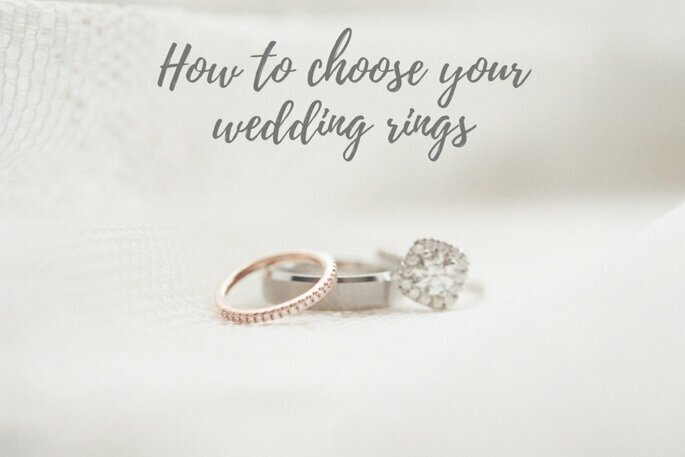 You will probably be concerned with larger matters of the wedding planning process at the beginning of the organisation period, such as the venue, catering or wedding dress, but don’t forget that the ring sizing and ordering process should not be neglected. To give you an idea, manufacturers spend about a month and a half in the making of your ring design. Despite this, we recommend you allow at least three months in advance to correct problems if they occur. Beforehand, you will have decided on the shape, engraving and measure, then, it’s a waiting process for the finished product. As we’ve said, the material is the basis of all ring designs, upon which the rest of the design is built. The winner among the majority of couples is usually gold, whether yellow, white or rose, and usually 14, 18 or 24 carats – depending on your budget, of course. However, it’s convenient to know that the weight of the gold is not always an advantage. In fact, the more carat the piece has, the more ductile it will be and, as a consequence, the more chance there will be of scratches and deformations. For those who are not gold lovers, silver, platinum and titanium are increasingly popular options that look great and cost much less. All of them have different weights and resistances, platinum being the most durable, but also the heaviest. 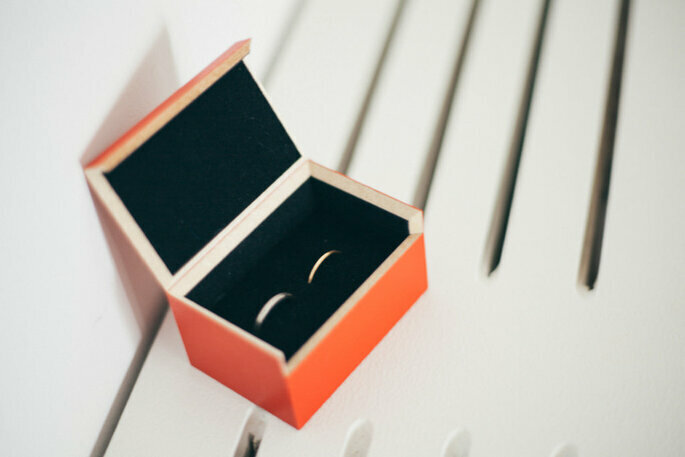 Recently, wedding rings with more innovative materials, such as steel or ceramics, have been added to the market, which suit lower budgets and don’t sacrifice beauty. If you decide what you value most in a ring, you’ll be happier wearing it for the rest of your life as a personal and unique memory. On the other hand, the measurement of the ring is important because it must fit perfectly to the finger, without being too tight. A wrongly fitted ring is also bad from the aesthetic point of view – you also want to avoid losing it if it is too big! To confirm that it is the right size, the ring should turn on your fingers easily, but not loosely. We have a trick that will help you to secure the perfect fit as well as avoiding unexpected changes. Try to go to your first appointment with the jeweller on a very cold or hot day, because the fingers could expand or contract at extreme temperatures and move away from the real measurement in normal conditions. So, if you are having a winter wedding, get your ring fitted on a cold day – and vice versa! Furthermore, remember that you may loose weight in the lead up to your wedding, maybe due to stress and nerves, or simply because you have dieted to make yourself feel more confident in your gown. So, if the ring is too big on the big day, don’t worry, it will be the perfect measure once your weight returns to normal. Even so, if after the wedding you still aren’t happy with the fit, remember that you can always get it resized! Once again, your style is key when determining the design of the ring. As you know, the ring is symbol of your union that speaks of you as a couple, so adjust the design to your tastes. Firstly, decide on the shape, since nowadays there is a wide variety such as round and square rings, with flat or half-round surfaces. Then, the finish has several possibilities: polished, satin finish, chrome, matte, brushed, textured, dotted or enamelled. In the jewellers you will be able to compare all the styles before choosing. Nowadays, jewellers have reinvented the design of wedding rings through extensive exploration. Some rings have special reliefs, unique inlays, minimalist aesthetics, borders, a mixture of materials, adornments and sparkles… your ring will be a true work of art, carried with you on your fingers for a lifetime. Furthermore, some jewellers that specialise in weddings can personalise the rings according to each couple, who can determine the style and the added extravagances. Although it is better to rely on professionals, it doesn’t hurts to add your own stamp that is unique and original. It is also important to remember that, despite what traditions dictate, wedding bands do not have to be equal. Some couples differentiate their rings with a special touch, such as bright inlays in the rings of women. Before ordering your dream wedding ring, consider whether it would be all the more special with a personal message. 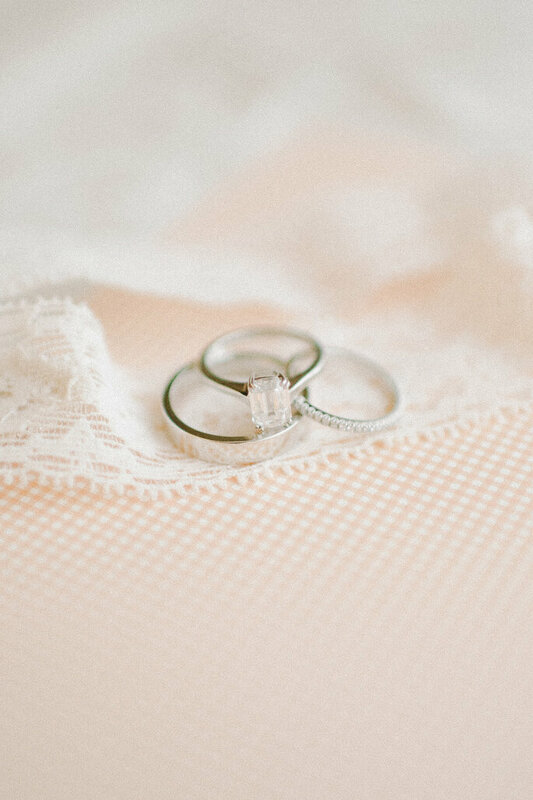 Although many rings include the name of the couple, many brides and grooms choose to write their affectionate nicknames, include a special comment, or surprise each other with an unusual message. It’s up to you, and whether your chosen ring shape/design has the space for much of an engraving!